Born in the West, I studied photography and painting at the School of Visual Arts in New York City, and retouched the b/w photographs of Robert Mapplethorpe, before the western skies called me home. Burnt sienna was my favorite color in New York. Now that I live surrounded by copper rich burnt sienna mountains in Bisbee, Arizona, I paint as I retouched in NYC black and white. The photographer is the painter. My paintings can be seen at http://www.cheyennemacmasters.com. Please contact if you would like to buy prints of the photographs or use for reproduction. All photographs on this site are copyrighted by me. Occasional guest photographs are copyrighted by the photographer. I’ve been getting quite a kick out of your orbs, but I haven’t seen any myself. I must be doing something wrong, or maybe I should pray that at least one with appear soon. Thank you for visiting by blog again. Thank you. Basic steps for photographing orbs at night: digital flash, helps if your camera has a CCD sensor rather than the CMOS sensor that filters most of the orbs out. Canon PowerShots except for the latest G16? have the CCD. You may be getting them, but they’re too pale. On the computer brighten and then lower the contrast, that will bring forth the pale ones. And, last but not least: intent, intent, intent. Well deserved! Hope you enjoy! Thank you so much, if there was a Sweetest Bloggers Award, Motioners would win unanimously! Congratulations to you for the honor you have received! Much deserved!! So glad to find you here. I have been enjoying the validation of “things” unseen in this same way since the summer of 2011. I have a few outstandingly mysterious photos…not sure how to share in this format with you. Bow of Gratitude to you for your sharing! Glad you found me too. I’ve sent a reply to your site. . . Thank you for finding and following dragonshades. I love orbs whatever they are and am always pleased when they turn up in my photographs. On Sept 4 I posted a photo called Colour Comet. These look like wee Scottish tartan orbs and appear quite often in my garden photos especially around my Scottish dogs! Thank you so much! I feel truly honored by all your appreciations and encouragment along the way. Best wishes to you and all you have honored and shared with us. 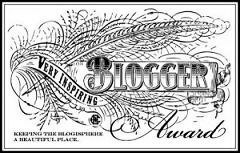 nominated you for Blog of the Year 2012 award. Very well deserved! Thank you so much, Jacquie Bloggera! I am truly honored to be recognized by such a fine artist. It is a real pleasure getting to know of you and your work. Thank you so much, Jacquie Bloggera, for such an unexpected gifting! And, congratulations to you. Well deserved! Hello Cheyenne and many thanks for finding the time and the energy to drop in – and to follow – the “beeseeker” – glad to have you aboard, but I am not sure where we are going. Thank you for dropping by Orbs Delight in the midst of the blog universe. Don’t know where we’re going? How fun! Thank you for visiting, I hope you continue to enjoy. I know you’ve already received one, but I couldn’t help myself! I’m not a photographer but do enjoy your “orbs” and am also following your blog. Thank you for following my blog of orbs. I am also enjoying the twists of your writing. I’m so glad I found your blog! I have been capturing orbs in photographs beginning about two years ago, and I’ve tried to find information online about them. Most spirit photo experts I’ve come across seem to quickly dismiss orbs as dust or moisture particles reflected by the flash of a camera, with long explanations about aperture and shutter speed and on and on. Despite their beliefs, I have recently started my own blog, where I have begun posting some of my own orb and possible spirit capture photos. Thanks so much! Thank you for your comment, Susan. I look forward to seeing your orbs on your blog. Some people know that they know and can’t possibly imagine that there are still wonders to discover if they but open their hearts and minds. Thank you very much for your kind honor. I have several photos of my children with large orbs surrounding them. Of orbs. Could I send them to you? I’d like to have a professional look at them. I would be delighted to see your photos, Amber. You can send them to me at info@orbsdelight.org. Small files are easiest for me to access. I would love to see your orb photos, Lisa. I’ll send you an email from Cheyenne.